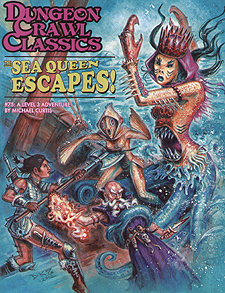 Dungeon Crawl Classics 75: The Sea Queen Escapes! Evil lurks beneath the ocean! For years it has slumbered, but now it rises once again, threatening to wash over the surface world like a monstrous wave. Only a handful of stalwarts stand between the nefarious schemes of the deep and a world drowned in sorrows, but first they must navigate a wizard's sanctum, a magical prison, and the most unusual dungeon they've ever faced! Can they stem the tide in time or will they lose themselves forever to the Sea Change curse?